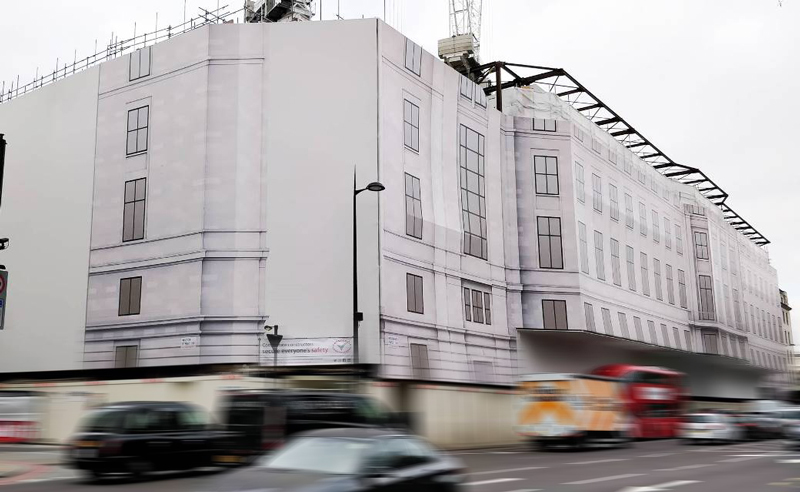 THE DEVELOPMENT 33 Grosvenor Place, a former office building, is being converted into a leading healthcare facility – the first European home for the Cleveland Clinic in London to expand the international delivery of their specialised medical care. The Cleveland Clinic London will open in 2020. The scheme comprises of the redevelopment of the property whilst retaining the original façade, alterations to three aspects with the partial demolition and redevelopment of the western elevation.  The existing fifth floor will be demolished and redeveloped with the addition of a roof top extension creating a new sixth floor. THE BRIEF The complex project involved multiple stakeholders including Cushman & Wakefield real estate services, PLP Architecture & HKS Architects, the main contractor Erith Group, Swanton Consulting and the end client Cleveland Clinic London. 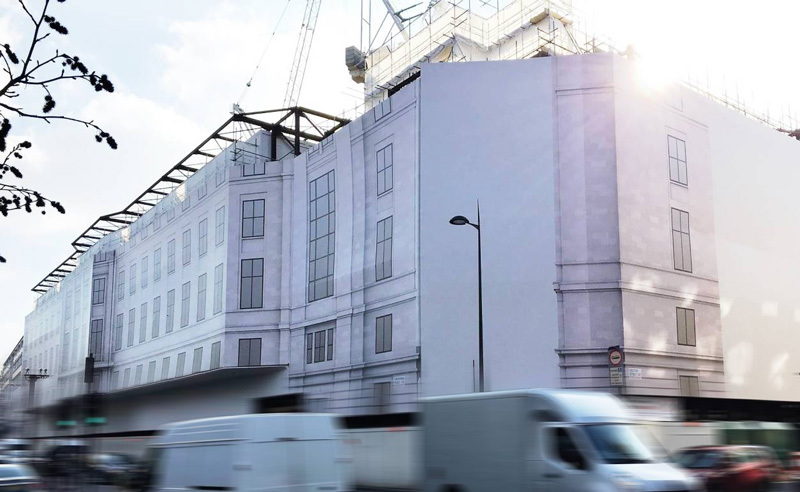 Our clients required a decorative wrap to cover all four elevations of the building – an area totalling over 3,500 square metres. 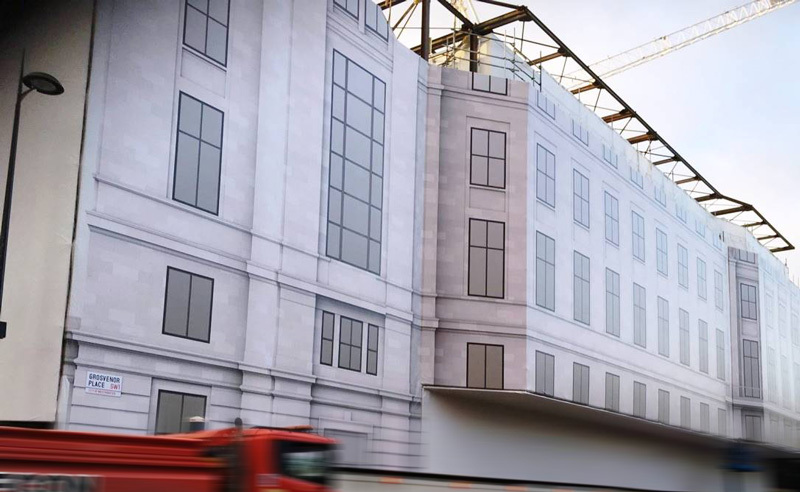 The banner would disguise the demolition and redevelopment works and present an image of the ‘business as usual’ building from multiple elevations including Grosvenor Place overlooking Buckingham Palace, into Wilton Street and Chester Street. A final solid Grosvenor Estate magnolia print would feature facing into Chester Mews. 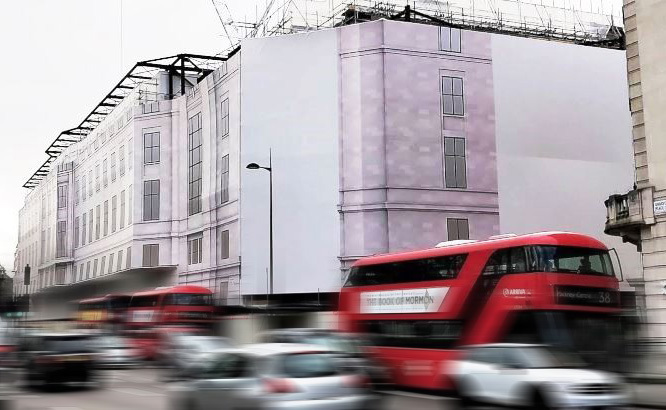 THE SOLUTION The final building wrap measures 3,572 m2 – to give an idea of scale that is the same as a wall of one hundred and twenty 40ft shipping containers and is the largest ever seen in the United Kingdom. 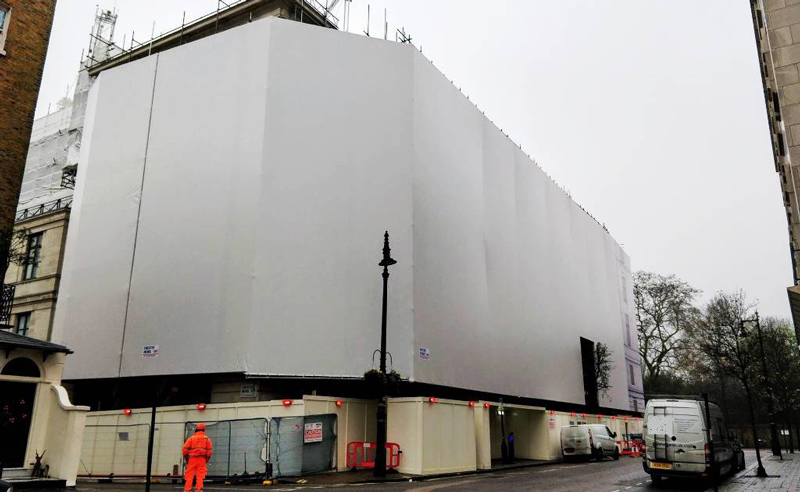 Due to the scale of the project the complete installation is made up of eight separate extended banner frames offset from the steel façade retention system & then clad with digitally printed solid PVC banners. The project was delivered in stages – whenever the steel façade retention contractors delivered each section we commenced our works as they concluded theirs. The eight separate extended banner frames measure just over a mile (1,500 linear metres) and are attached with 2,000 couplings and fittings. The banners were attached and tensioned off using 800 metres of elasticated bungee ties from MEWPs (mobile elevating work platforms) or the scaffold behind. 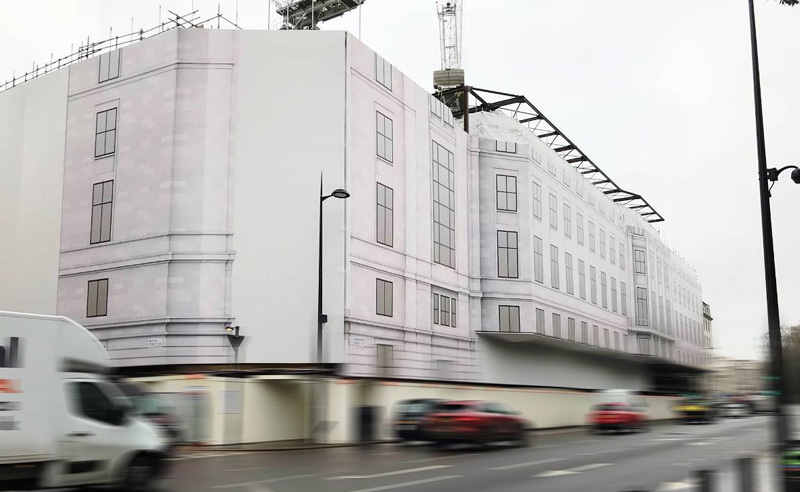 As part of the building wrap extended out high above the road where buses and high-sided vehicles frequently pass below we were severely restricted on when and where we could work over these areas. Working closely with the Erith Team on site we always found the best solution. Banners of this magnitude take considerable co-ordination at all stages – not only the print and manufacture but also in ensuring the creative design on the eight separate banners would line up perfectly next to each other on site to deliver a seamless join. The end result not only enters the UK record books but looks magnificent. Being Embrace, the entire project was delivered at the agreed price – which we guarantee – and on time.